Unless and until we end this broken business model, our industry will always be inefficient and held in low regard with practitioners who are financially strapped! Most of you have this ethical dilemma of wanting to get your patients and clients the fastest, most permanent results, but you know if your clients don’t have their complaints or symptoms anymore — they won’t re-book with you until their complaints come back. Side #2- You don’t want to lose the revenue you generate from their appointments with you! To try to remedy this ethical catch 22, some practitioners drag out the care they provide, so they can squeeze a few more session fees out of the client. Other practitioners help their clients see results and hope once they leave the practice, that client will feel so great, they refer their friends and family. There is a deep dilemma to operating a business with competing goals. It’s NOT ABOUT LEARNING RE-BOOKING SKILLS, NOR SELLING PACKAGES! How do you remedy this conflict, so you are not continuing to chase clients, and chase revenue while also confidently acting in full integrity? You determine the best, most effective therapy plan for each and every client or patient you bring in to your practice to take them from where they are to where they want to be. In our practice it has always been about taking the clients & patient through what we call the “4 Phases of Care — Road Map to Wellness”. Taking your clients through the 4 Phases of Care, practically eliminates your need to constantly worry about finding new clients, while providing the utmost level of support for your client AND being completely ethical! This Road Map to Wellness is a formalized structure that helps your clients get their best results — fast. Start with getting the patient out of an acute situation so they are comfortable. Take them through the process of corrective care to address dysfunction causes and problems. Once they are where we and they want to be, we move ’em up to maintenance phase. When they really want to go wild — bring on the Wellness Care! 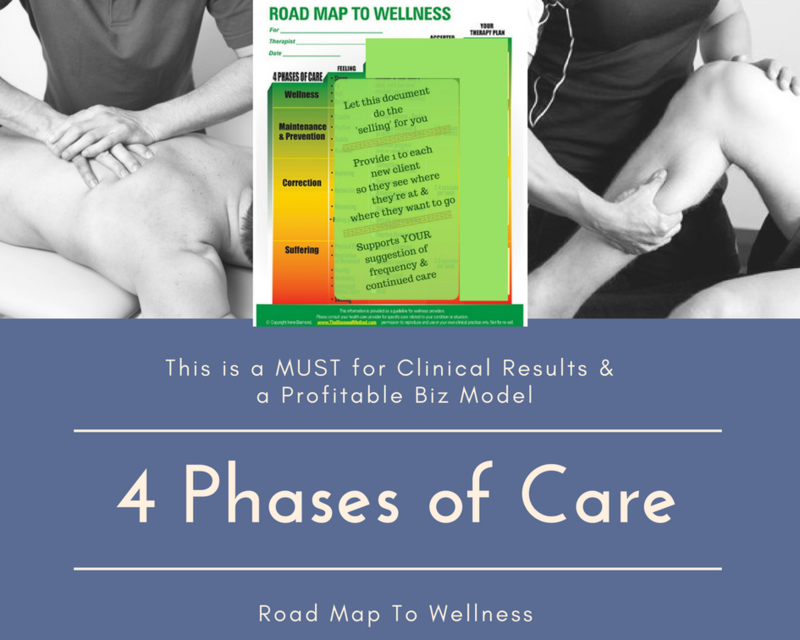 This “Roadmap to Wellness” concept is taught to the Active Myofascial Therapy students so they too can incorporate the 4 Phases of Care effectively into their own practice. Are you ready to change your business model to one that actually encourages your clients to get fast results without it back-firing on your bank account? What will you do now to end YOUR ethical dilemma? Previous Post 3-Step Easy Client Re-Booking System Next Post Should Your Business “Do” A Groupon?